How do the best house washers – wash houses? HERE’S HOW! Wash a house with the intention of removing pollutants, surface oxidation, as well as removing mold and mildew. By doing so you provide customers with an excellent result and make competitors that wash a house with what EnviroSpec calls the “splash and dash” method look like the amateurs. “Splash and Dash” refers to the person that “splashes” bleach or dish washing detergent on the house, gives it a quick rinse, grabs the check and leaves. There are various levels of clean, and various qualities of work. The tools and supplies you need are a pressure washer rated from 4 to 6 GPM and from 1500 to 2000 PSI. You will need an Allison Super Suds Sucker chemical injector, a quality house wash detergent, a surface sealer, a brush and extension pole. Washing a house with a pressure washer is accomplished in four steps. The four steps are, detergent application, high pressure rinsing, surface sealant application, and another high pressure rinse. For washing most types of siding, use Limonene or Premier. If you are working on a house that is covered heavily with mildew, use Emulsifier Plus and add a little bleach. Apply the detergent concentrate through your Allison injector. 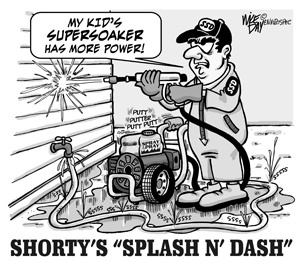 Always apply detergent from the “bottom-up” and high pressure rinse for the “top-down.” Do not use an x-jet type nozzle because it will force detergent under the siding and create a high pressure detergent ‘mist’ that will saturate other surfaces in the neighborhood. An x-jet type nozzle is great for the “Splash and Dasher”, but because it is a high pressure nozzle it forces the cleaning solution underneath the siding where it will emulsify (dissolve) pollutants and cause “streaks” as it drips out over the siding later. Always adjust the strength of your detergent by running a test pattern in an inconspicuous area on the house, maybe behind a bush. One of the most common problems a house washer has is thinking that “more is better” and with some detergents more is indeed better but not with EnviroSpec ‘job-matched’ high performance detergents. Always apply detergent to an area that is small enough so the product can be removed before it dries on the surface. Never allow any product to dry on glass. Remember that once you have applied the detergent you will be switching the injector from “low-pressure detergent” to “high-pressure rinse” and when you do you will have a hose that is full of detergent. This means that for a short period of time the remaining detergent in the hose will be coming out under high pressure. While in this phase make sure that you “clear” that remaining detergent onto the lower part of the house such as the foundation of the house. If you clear it “high” you will be creating the same problems that you would have with an x-jet type nozzle as described earlier. Always avoid getting detergent on the roof. You will need to pressure wash by “pattern cleaning” in an over-lapping method much like you would when spray painting a surface. Work from the top to the bottom. As the siding is cleaned, work slowly back and forth with the nozzle about three to eight inches off the surface. On heavily oxidized siding try running with hot water, around 150 degrees. Hot water helps cut surface oxidation. A water temperature in excess of 150 degrees is detrimental to detergent performance. On the other hand, if it is extremely hot outside you should try cooling the surface down with a cool, clean water, high pressure spray so as not to create an “alkaline shock” that could result in “flash” oxidation which shows up as a “dull” surface. After completing each section, rinse all windows thoroughly. Clean the gutter at the same time as the siding. 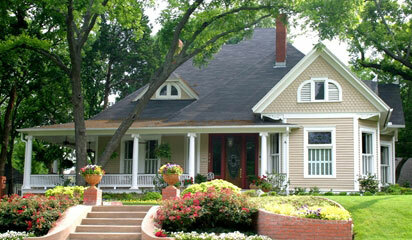 If the gutter is difficult you should complete the washing process and then go back and “touch-up” the gutters. To do this use a pail with a small amount of detergent concentrate in it. Dip a brush on an extension pole into the detergent and “run” the entire gutter with the brush. Re-rinse the areas under the section(s) of the gutter that you touched up. After completely pressure washing the siding, reverse direction and apply Plex Master surface sealer. Apply and rinse one side of the house at a time until completed. This treatment will take about 20-30 minutes to complete on a 2,000 s/f house. Again, do not allow the sealer to dry on the glass.